BRASÍLIA, BRAZIL – National pride is celebrated in Brazil this Saturday for Independence Day or Sete de Setembro (7th of September). Most cities in the country will host celebrations for the national holiday that pays homage to the Declaration of Independence from Portugal on September 7, 1822. Onlookers watch a Sete de Setembro parade, photo by Agência de Notícias do Acre/Flickr Creative Commons License. In Brasília, a military parade is held at the Eixo Monumental (Monumental Axis) where around 30,000 people attend, costing R$829,000 this year. In Rio de Janeiro, for Sete de Setembro a military procession will parade along Avenida Presidente Vargas towards Candelária Church, in Centro starting at 9AM. Similar celebrations are held in all the state capitals, as well as many other smaller towns across the country. “I enjoy the marching band on the streets and in little towns they still celebrate like they did centuries ago with fireworks, people on the street, lots of children and popcorn carts everywhere,” said Salvador-based DJ Jerus Leao who spent several years living in Toronto. 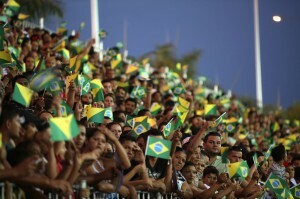 President Dilma Rousseff will attend the celebration in Brasília despite fears of major protests. Security this year has been increased as demonstrations are planned in many cities, including the country’s capital through social media networks. After the wave of protests in June, Rousseff reached her lowest approval rating. Criticized for inaction at the time, the Gabinete de Segurança Institucional (GSI) started monitoring sites such as Facebook, Twitter and Instagram. According to Brazil’s Minister of Defense, Celso Amorim, the demonstrations will not affect the show. “Security will be adequate but not intrusive. No fuss so the people can celebrate,” he told Globo newspaper after a meeting between ministers at the Presidential Palace. The crowd at Brazilian Day in New York City, photo by garethferrari/Flickr Creative Commons License. Patriotism is not only seen in Brazil this week, every year many large cities around the world celebrate Brazilian Day, commemorating Brazilian independence. In New York City, the annual celebration brings in a crowd of more than 1.5 million people. The free event held on Sunday, September 1st this year took place in Little Brazil in Manhattan near Times Square. The event started in 1984 by a group of Brazilians who wanted to feel close to their homeland and celebrate Brazil’s Independence Day. 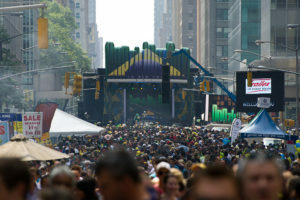 One of the largest street festivals in Manhattan, Brazilian Day is an opportunity for both Brazilian immigrants, Americans and foreign visitors to enjoy the country’s culture, which might include sipping caipirinhas, eating native cuisine or samba dancing. The main event is a concert of popular Brazilian artists, with Globo TV televising the performance live to Brazil and 135 other countries. Similar celebrations are held in San Diego, Toronto, Los Angeles and London, among many other cities. While many countries honor their own freedom from previously more powerful countries, few see their independence celebrated all around the world as Brazil does every year.